Afrotastic Diva, Muma Gee and her husband have announced a definite date for their wedding. It will hold on Friday, December 23, 2011 in Port Harcourt. The couple already did their traditional wedding sometime last year, but had to delay on the church wedding due to their different professional commitments. Muma Gee has been working on a new album. She just concluded the shoot of the musical video for her new song entitled, “Port Harcourt is Back.” It was directed by her husband, Prince Eke. Madam match2match i dey feel u anydayanytime. I love to sing this song some years back as a teenager. It was my dad favorite song from a band called Peacorks international. The track is called, "This Girl". The song is in Ibo language. Goes like this. Angelina is very pretty and worthy of marriage, Dorathy is pretty and worthy of marriage. Angelina amaala mma alu alu, Dorathy, amaala mma alu alu, Should in case a chowa onye ga-alu ya, I am sorry, aka m adighi ya 'Angelina is very pretty and worthy of marriage, and Dorathy is also very pretty and worthy of marriage' But then﻿ goes on to warn, 'Should in case, (in the event) there is a search for husband for the two ladies, I am sorry I wish to have no hands in it. In a nutshell, the message was clearly, that being chic did not translate into being a potentially good wife. I have seen most funky and pretty babes but are never potinetial good wife or husband. You must live with whatever choice you both has made. Madam hope you will have time for your husband? To the man, don't forget your duty as the head of the family, sorry as the husband. May God bless your marriage. They did their traditional wedding sometime last year 2010, but had to delay on the church wedding due to their different professional commitments. Can someone read the line of this story. There is some falacies in this news. They got the money, fame and more. Why the delay? Can someone tell me reasons behind the delay. Professional commitments???? Hope they have think deep sha. No separation, no divorce due to professional commitments or whatever name they choose to call it later. We want to see this marriage work perfectly well. Muma Gee, am more concern about you and your lifestyle. May God almighty bless your marriage aboundantly IJN Amen. WOW they acted together in a movie. 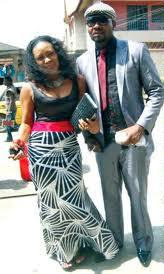 he was dating her daughter in that movie, but he left the daughter and married muma gee. congrats to them. hpe dis adede marries and pray it lasts she deserves her own bit of happiness. I happi for them! I pray it will last because dis stars and marriage ting sef, I don't know why they can't in marriage.